The fourth quarter is the most wonderful time of the year for direct-response Facebook advertisers. Consumers are actively online and looking to purchase. They intentionally want to buy gifts for family, friends, and even themselves. In 2017, Facebook reported that 70% of millennials are influenced in their holiday buying by Facebook and/or Instagram. And indeed, based on the years I’ve been advertising on Facebook, CPMs (cost-per-thousand impressions) during this time typically rise, but CPAs (cost-per-acquisition) decline rapidly. The days between Thanksgiving and Cyber Monday are when most consumers are looking for deals. Discounts and free shipping abound. 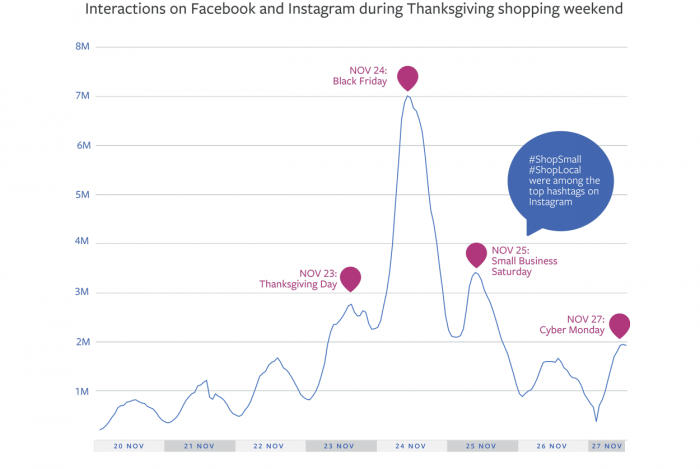 Look at the spike of interactions on Black Friday in the graph below. The “phases” strategy proves that warming consumers up to your company/offer before mid-November (Phase One), combined with targeting previous customers and re-marketing during Black Friday through Cyber Monday (Phase Two), and then continuing to re-market plus a small amount of prospecting post-Cyber Monday (Phase Three) can really be successful. Utilizing multiple objectives in Q4, especially in Phase One, can also help you spend horizontally, versus vertically. 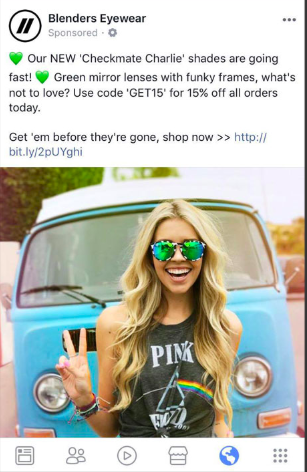 This tactic helps you reach people in new ways and doesn’t require you to only focus on “converters.” Converters are only a small portion of the overall Facebook audience, so targeting potential and past customers with Page Post Engagement ads is a great first step in the horizontal methodology. There’s plenty of nuance to this approach so if you find this topic interesting, we’ll be diving deep into these phases in my upcoming course with Jon! Even while considering these phases, many advertisers lack a comprehensive plan. You have potential customers, existing customers, your email list, your website Custom Audiences, and more at your disposal for targeting. But how do you use them all? You want to generate new creative assets, but what should you do first? These examples and more sum up why it’s absolutely essential to have a solid plan going into Q4. I’ll be brutally honest: you can’t just keep running the ads you’ve been running all year. You need ads that are specific to Q4 and to the offers you’re putting out throughout the holidays. They should be different because consumer demands are different. 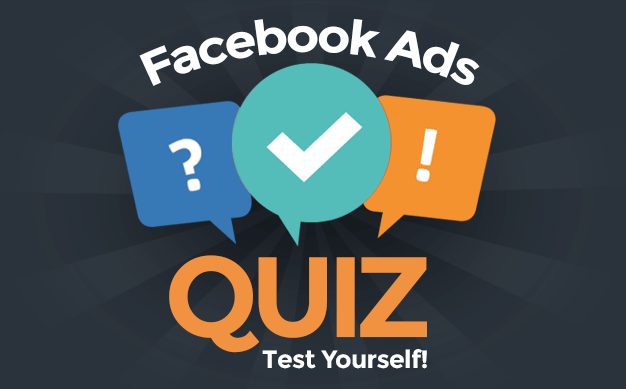 Next, we’ll go over some creative and audience testing you should start NOW to help inform your Q4 plan. Since you’ll be speaking to potential customers, previous customers, previous engagers, and previous website visitors all within Q4, ensuring they all don’t see the exact same message is ideal. You want general message alignment, yes, but speaking to different people in different parts of their customer journey will help to drive revenues and lifetime values higher. Different people respond to different types of ads and ad sizes. Some may convert on a 1000×1000 photo post (to the right) while others might convert on a video carousel. This is why it’s always important to test, test, test. There are a few must-do creative tests you’ll want to run before early November. Why? This testing will help inform the ads you create for Black Friday through Cyber Monday, thanks to a better understanding of what consumers are responding to. Having a clearer understanding of these creative and copy components before Black Friday can help optimize your ad spend and give you greater confidence in knowing what consumers are going to be interested in. They can guide image and copy decisions and make you more confident during some of the most important days of the year. Ask yourself this question: What audiences do I currently have in my toolbox that I could target during a sale? These audiences are all popular (as well as typically successful) because they are already familiar with you. If you have a smaller budget, focusing on these audiences during the Black Friday – Cyber Monday timeframe will likely be enough to show some serious ROAS and revenue. But what if your “galaxy” could be expanded for use in Phase Two? You shouldn’t wait to target new customers as soon as Black Friday hits because every single major brand will be trying to do that — and they have the bucks to do it. And to be honest, you probably don’t have the budget or time to compete with those insanely priced CPMs. PLUS you’ve made more people familiar with you and your brand, more potential customers have been to your site, and more people have engaged with your products. Seriously, triple win! To be clear, I’m not suggesting you have to do all of these things in this exact sequence. The purpose of mentioning them is to simply provide options in utilizing multiple objectives which can help you grow your awareness and audiences as we go into a very competitive advertising time. This is just skimming the surface of what’s possible — learn more about these testing strategies and more in the upcoming course we’re doing all about Q4.